The elusive round wicker chair in YoungHouseLove nursery. After Sherry confirmed that this chair has remained comfy after a year of nursing, my desire to make this chair mine increased exponentially. Not for nursing, mind you, but because it is vintage, comfortable, AND looks so unusually cool. Several times, I found this chair on craigslist. But they were all near-misses, as craigslist frustratingly tends to be - someone got to my chair first. But last weekend, my persistence finally paid off. We drove an hour to get this lovely chair for a mere 35 bucks. 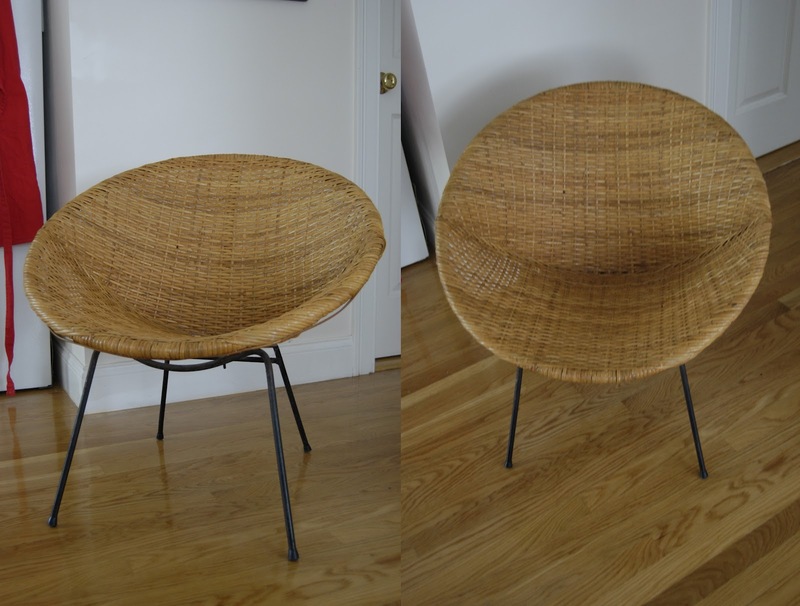 1960's round wicker chair. I love it. The chair is in great condition. Other than a small tear in the wicker on the seat, there is no obvious damage to the chair. And, as Sherry promised, it's super comfortable. I can't wait to find the right place for it in our home. And once we buy a house with a backyard (wishful thinking) where I can spray paint things, I will probably paint this chair white, legs and all. For now, I think we will enjoy it as it is - lovely and comfortable. I have the same chair that I got when my grandma moved out of her house. I tried to get some info on it but she cant remember, just that she has had it since the early 60s. They are very cool looking chairs but zero identification marks on it. Im surprised you got if for only $35, I was about to sell mine but if it only gets that low of a price going to keep it. I think the price depends on the condition of the chair and where it's sold. 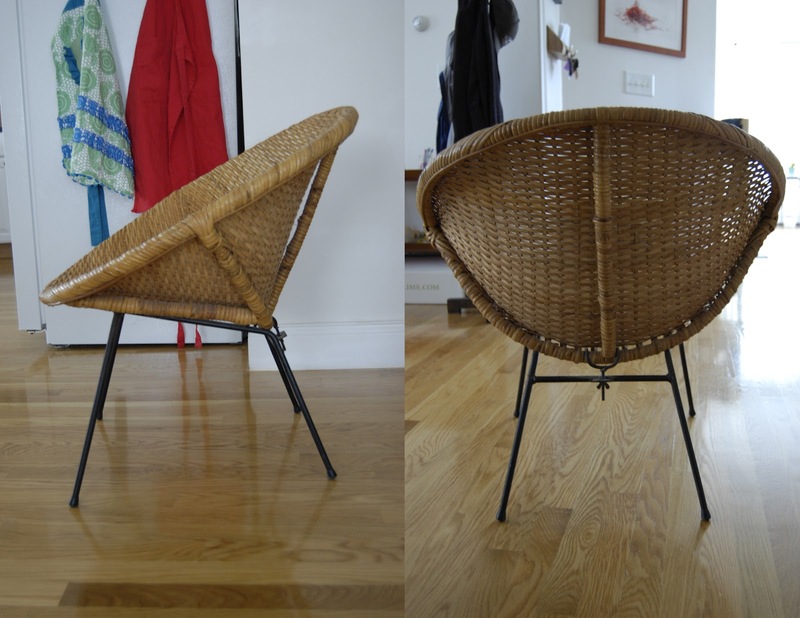 Mine has some damage to the wicker, not enough to bother me but it's definitely not in an ideal condition. Also, furniture tends to be cheaper on Craigslist. I've seen similar chairs listed for a higher price on eBay. my parents had these chairs when I was a very little girl...some of my best memories are falling asleep in this chair only to wake up to my dad coming hme from work....enjoy! I want my own chairs formy kids to love!!!! Thanks! I do love this chair, and I get the feeling any future kiddos would enjoy it even more than I do because it just seems perfect for curling up on.